Having a specific glass for red, white, coffee, juice, etc. is nice, but unnecessary, especially when space is limited. Here are beautiful, stackable and dishwasher-safe options that are suitable for nearly every drink. Iitalla Lempi Glasses are a beautiful, and stackable, all-purpose style; $75/set of 4. 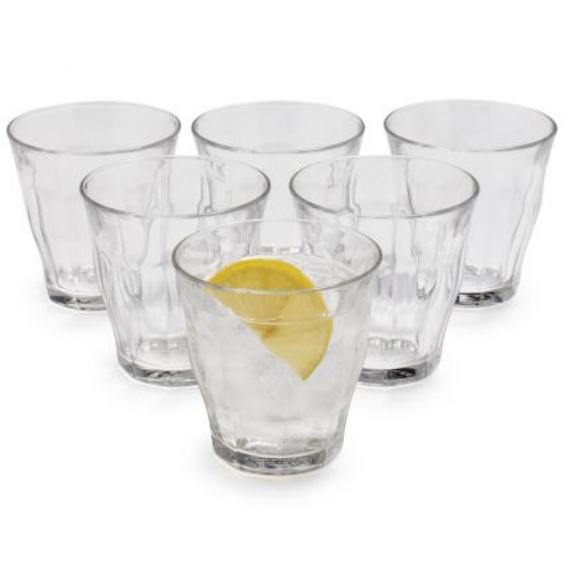 Used for everything from juice to wine, Duralex's Picardie Glasses are virtually indestructible (I can vouch); $24/set of 6. Love the shape of these stackable glasses by Menu; $64/set of 4. Spanish wine glasses are perfect for wine, juice, water... $6/ea. Ikea's 365+ Glasses can hold hot and cold beverages. They are stackable and dishwasher safe; $1.99/ea.